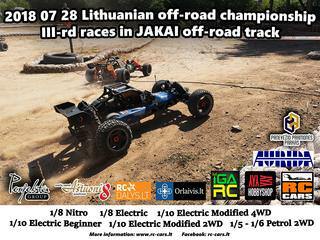 On 2018 07 28 „RC-CARS“ Association invites you to the III-rd races of the Lithuania Off-road Championship 2018. The race will take place in JAKAI off-road track. Attention! Start of the competition 9:00 am. Lietuva, Jakai, Klaipėdos raj., Šviesos g.